Pianos & Organs-Gerber Moving & Storage, Inc.
Home / Kansas City Moves-Gerber Moving & Storage, Inc. / Pianos & Organs-Gerber Moving & Storage, Inc.
We are piano specialists. In addition to individual owners, many Kansas City area music stores trust us to deliver instruments to their customers. In fact, when Steinway & Sons took the piano on tour that marked its half-million production level, the legendary piano manufacturer entrusted that special instrument to Gerber Moving for receiving, assembly, and transportation in the Kansas City area. Moving—We move all pianos, organs, and other musical instruments on appropriate dollies, positioning grand pianos on their sides, for safe, secure transportation. Storage—If you need to store your piano for any length of time, you’ll rest easy knowing that it will be in the climate-controlled area of Gerber’s modern storage facility. Schmitt Music—We deliver pianos for Schmitt Music in the Kansas City metro area to homes, studios, and businesses. We also deliver nationally for them, including inventory transfer between their Denver, Kansas City, and Minneapolis stores. 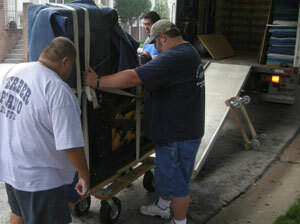 We handle delivery, un-crating and preparing pianos for tuning, restoration or detailing. In addition, we provide overflow storage for Schmitt Music when their showrooms don’t have room for their substantial inventory.